After 20 years on the ATP circuit and 20 Grand Slams Roger Federer has become the greatest tennis player of all time. These achievements, plus his never ending record-breaking streaks, are now celebrated in the first large-format, elegant coffee-table book about the Swiss role-model icon. There have been approx 30 books written on Roger’s tennis technique, but not one elegant book on the man himself and what makes him tick. From Federer’s first appearance on the ATP World Tour as wild-card entry at a clay-court tournament in Gstaad in 1998, to landing his 20th Grand Slam title at the 2018 Australian Open, he has played with an unparalleled elegance, perfection and artistry. The award-winning tennis photographer Antoine Couvercelle illustrates, with over a hundred beautiful images, the emotion and humility of this Swiss tennis ambassador. Accompanying the photographs are mini-essays from leading tennis journalist and author Mark Hodgkinson, who has witnessed most of Federer’s career highlights, and has interviewed him on many occasions. 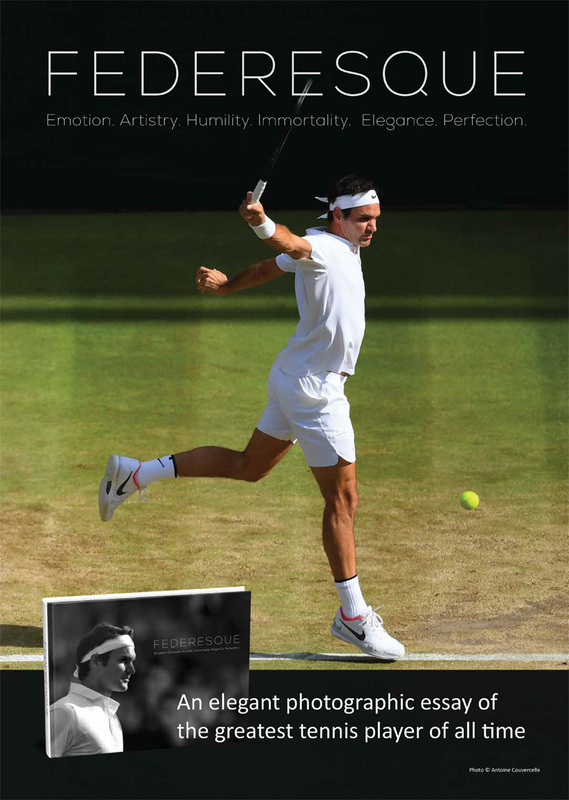 BTL-Beyond the Lens is very proud that ‘Federesque’ has been created, designed, published and printed in Federer’s home country, so like the man himself, Made in Switzerland. This book is to be admired during Roger’s current winning streak (at the age of 36) and to be cherished the sad day when hangs up his racquet. It is now available from all leading book shops around Switzerland and also some selected department stores at retail CHF 55.00. We have special pricing conditions (on request) for bulk purchases by corporations as professional VIP gifts.